5 posts categorized "Jewelry Insurance"
After you have purchased that special diamond, there is still one more important step to ensure your future happiness. That step is to adequately insure your diamond against loss or damage. Next to an automobile, many first time diamond buyers find this is the largest personal property purchase of their life. Things happen that are out of your control, so it’s important to purchase ring insurance for extra peace of mind. It’s also important to sign up for this coverage right away! You have two options when purchasing insurance; you can get an extension or “rider” on your current renters/homeowners insurance, or you can purchase insurance through your jeweler from a third party such as Jewelers Mutual. Ring rider insurance – Renters or homeowners insurance generally covers items in your home, but does not take into account high value items such as engagement rings. Rider insurance will cover these items for an additional fee. This insurance option is very common and may qualify you for a cheaper rate through customer discounts or because you have multiple types of insurance. Third party insurance – If you don’t have a renters or homeowners policy, you can purchase insurance through your jeweler. Advantages of this type of insurance include having individuals knowledgeable about insuring jewelry right at your fingertips and more comprehensive coverage that takes into account the unique characteristics of your ring. Both types of insurance require you to submit an appraisal. Is my ring covered if something happens accidentally? Does it have to be stolen? Is there a reason my ring wouldn’t be replaced? How will my ring be replaced? Do I get a check or do I have to go to a particular jeweler? Do I have to “prove” the ring is missing? Is the full cost of my ring insured? NEW! Expanded Coverage for Personal Jewelry Policies. Since 1913, Jewelers Mutual Insurance Company has been the company that jewelers trust to protect their jewelry business, and it's with confidence that they mention Jewelers Mutual to their customers for their personal jewelry as well. In addition to worldwide protection against loss, theft, damage and mysterious disappearance, Jewelers Mutual's personal jewelry insurance policy now includes coverage for additional preventive repair to help policyholders avoid a larger, more painful jewelry loss. Expanding the types of damage our policy covers helps bridge the gap between what a typical retailer warranty or service plan may include and what our repair and replacement coverage provides. For insuring your valuable jewelry items, we highly recommend Jewelers Mutual Insurance Company. It happened again today. A client called us asking for a replacement ring for the lost engagement diamond ring we had sold them. Unfortunately, they had not protected themselves by getting insurance for their diamond ring. Diamond Source of Virginia provides clients a free insurance appraisal with their diamond ring but it is the client’s responsibility to get the ring insured. Many choose to get a scheduled property rider with their homeowners or renters insurance. Another great option for jewelry insurance is through Jewelers Mutual Insurance Company. If you need to insure your jewelry or just want to compare you current coverage and rates, get your free, no obligation quote and learn about coverage details, visit www.JewelersMutualinfo.com where you can enter A00108 as the unique Jeweler Code. As the holidays approach and shoppers are busy picking up special gifts, it is time to give some attention to making sure you have adequate insurance for your personal valuables. Most items you purchase are receive a gift are covered as personal property under your homeowners or renters insurance. Therefore, your new flat screen TV, iPod, computer, golf clubs, sofa, or lamp is probably covered if your house or apartment is insured. However, some articles (jewelry, coins, stamps, furs, firearms, and silver flatware for example) have limits to their coverage. Since my business is diamonds, I will focus on the jewelry category. Most homeowners’ policies have a limit of $1500 to $2500 for jewelry per event. That means if someone breaks into your home and steals all of your jewelry, you only get the $1500 to $2500 limit of your policy. While most policies cover damage and theft, many policies do not cover accidental loss so if you lose your engagement diamond ring you might be getting nothing. To adequately protect your jewelry items, you need to add a special rider to your standard policy. This rider, also called a schedule, typically required to provide a record of value that schedules the item’s coverage limit. 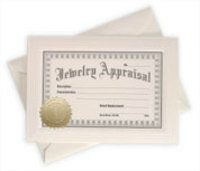 For jewelry, an insurance appraisal is often required to accurately describe and value the scheduled item. Unlike most other property insurance, the scheduled property rider generally does not have a deductible. The scheduled rider provides coverage for loss, damage, and theft. Unlike your sofa, whose value automatically inflates each year with most replacement types of homeowners’ policies, the scheduled property rider for jewelry limit of coverage stays at the value listed on the insurance appraisal. That means that if the value of your jewelry appreciates over time, the cost to replace your jewelry in the future could be substantially more than what you paid. Make sure your insurance coverage keeps up with the replacement value of your jewelry. Most insurance companies recommend updating jewelry insurance appraisals every 3 to 4 years. The price of jewelry insurance varies by insurance company, value of the jewelry item, and geographic location but typically runs in the 1 to 2 percent of value range for annual premiums. We are amazed at the number of clients who do not get jewelry insurance, thinking they will save a few dollars in premiums. When something happens to their valuable diamond ring, they learn the meaning of “penny wise, pound foolish” the hard way. If you have travel plans in your future, think carefully if you really need to take all your expensive jewelry. The risk of theft, loss and damage increases as soon as you start your trip because you are in new surroundings, doing new activities and often in tourist areas that are the target of pickpockets, thieves and con artists. If you are traveling out of the country, check to be sure your jewelry insurance covers your property when you are traveling outside the United States. Because the risk of theft is so much higher in foreign countries, some insurance companies only provide domestic coverage. It is never wise to put jewelry items in luggage, especially with security personnel going through your belongings. The percentage of bags lost by airlines continues to increase and their liability for your lost luggage is very limited. Hotel rooms are open to cleaning personnel several times a day and safes in hotel rooms are not particularly secure. If you do not put your jewelry in your luggage or leave it in your hotel room, that means you are carrying it with you but that can be a problem at the security checks at airports or when carrying something all day as you travel or are sightseeing. This situation occurred several days ago when a man found a Louis Vuitton bag on a park bench while he was hiking in a Sausalito, just north of the Golden Gate Bridge. Inside the bag was a 12-carat diamond ring, pearl and emerald jewelry, a Cartier watch and roughly $500 in cash. The contents were worth about $1 million. While many would have been tempted to head for a pawnshop and cash in their discovery, John Suhrhoff returned the bag to Sausalito police who found the owners, the Ghannadian family of Toronto, who were in Northern California for a daughter’s wedding. 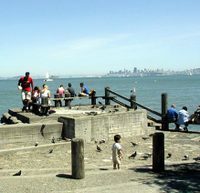 The Ghannadian family had an extra day before their flight back to Toronto so had decided to visit Sausalito, a popular tourist are with waterfront views of San Francisco. They had left the bag on a park bench near a tour bus depot and did not realize it until they returned to their San Francisco hotel. Not all lost bag stories have this type of happy ending, so think twice before loading your purse with all your jewels and heading on vacation.